The TopSpec Autumn Grand Prix Series opened with an excellent field of athletes as it launched at the Meadows Equestrian Centre recently. Victory in the first round of the TopSpec Mini Grand Prix stayed north as Tyrone native Jonathan Smyth and ‘Charlton Clio’ galloped home in 31.70 to land the spoils in the €2,000 sponsored class. Course Designer Aaron McCusker made it a perfect jump off with eight combinations making it through. The 1.40 Top Spec Grand Prix had a great start with John Floody taking the first round aboard ‘HTS Blackrock’. Autumn Grand Prix leading rider of 2017, Floody, started his campaign with an incredible win in a time of 33.90 with just under two seconds on Philip Gaw, who took up second place on the day with a time of 35.31. Darryl Walker and Caliva Charca MMZ finished in third position with a time of 36.10, just one hundredths of a second in front of Jonathan Smyth, who was back in the line-up, this time with Mulvin Lui, stopping the clock in 36.11. On duty, course designer Aaron McCusker built a fitting course for the opening round. Questions were asked from the start with the first round incorporating a series of related distances, which demanded careful riding. In the Meadows Four Year Old Championship, the win went to Conor McEneaney with this own ‘Shanroe Peeters’, bred by Dr Anthony Smyth. The Bay Gelding by Dallas VDL scored a very credible 95 points from judge Heather Ireland. 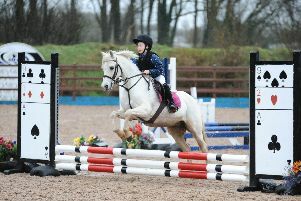 Second place on the day went to Jonathan Smyth with Willie Craig’s’ Ramiro B mare ‘Fyfin Gold’. 90cms - Divided between Jonathan Magee’s Cratlaghs Charlie (Stacey Watling), Robert & Diane Lowry’s Cullion Fusion (Rachel McKimmon), Melanie Zoe Geddis’s MGS Star De Reve (Melanie Zoe Geddis). 1m - Divided between Lawrence Patterson’s Drumnaconnell Goody Bag (Emma Jackson), Lawrence Patterson’s Drumnaconnell Opium Lux (Emma Jackson), Kate Kenwright’s Templemaley Captain (Kate Kenwright), Victoria Brown’s Sensations Bay Rum (Victoria Brown), Margaret Clarke’s Ice King (Sarah Clarke), Christine Cosgrove’s Leestone Uno Momento (Hannah Agnew), Paul Carr’s Ballyheerin Tango (Alison Irwin), The Ballydun Group c/o Edward Little’s Carnlea Bella (Edward Little), The Ballydun Group c/o Edward Little’s Carnlea Premier Balou (The Ballydun Group c/o Edward Little), J V Primrose’s Killyglass Diamante (Nathan Primrose), David Nelson’s Ameera (David Nelson). 1.10m - 1, Suzanne Posnett’s Karmijn (Suzanne Posnett); 2, Jayne Clarke’s Emby (Charlotte Harding); 2, Charlotte Eakin’s Ursus (Charlotte Eakin); 4, Beth Armstrong’s Orchard Echo (Suzanne Posnett); 5, Rachelle Harding’s Crossmaglen Bandit (Charlotte Harding); 6, Markus Buser’s Solsboro Gold Flake (Beverly Irwin). 1.20m - 1, Rory Lavery’s Glenkeeran Carsonstown (Rory Lavery); 2, Emma Jackson’s Creevagh For Sure (Emma Jackson); 3, John J McDowell’s Coloo Colin (Jonathan Smyth); 4, Patrick McWilliams’s Drumrot Penny (Patrick John McWilliams); 5, Declan Taggart’s Glenannagh Beach (Caitilin Taggart); 6, Ian Millar’s Master Millar (Simon Scott). 1.35m Top Spec Autumn Grand Prix - 1, Richard J W Smyth’s Charlton Clio (Jonathan Smyth); 2, Heffron Equine Ltd’s Afrika (Frank Curran); 3, Derek Gaw’s Ardnacashel Coovella (Philip Gaw); 4, Ronald Ross’s Gilbo VD Gulden Z (Ronald Ross); 5, Peter Smyth’s Shenanigans (Peter Smyth); 6, Emily Horgan’s Bua Gan Noctadh (Peter Flanagan). MEC Four Year Old Championship - 1, Conor McEneaney’s Shanroe Peeters (Conor McEneaney); 2, Willie Craig’s Fyfin Gold (Jonathan Smyth); 3, Peter Smyth’s Candy Lane (Alison Irwin); 4, Conor McEneaney’s Shanroe Junior (Conor McEneaney); 5, Yvonne Whiteside’s LGS Safari (Yvonne Whiteside); 6, Yvonne Whiteside’s LGS Kite (Yvonne Whiteside); 7, Carol A. McLaughlin’s Calle Cool (Shane McCloskey); 8, Thomas McLean’s Ballyrobin Brave Heart (Katy Connor); 9, Lawrence Patterson’s Ballycreen The Kings General (Emma Jackson); 10, Yvonne Whiteside’s LGS Charlie (Yvonne Whiteside); 11, Colm Doherty’s Valentino Princess (Stacey Watling); 12, Charlotte Gibson’s Lancer Luck (Lucy Gibson); 13, Colm Doherty’s Shutterfly Rivie (Stacey Watling); 14, Philippa Auret’s Kontiki (IHB) (Noel Mckee); 15, Patrick Breen’s Carneyhaugh Octave (Stephen McManus); 16, Ash-Lee Brown’s Omard Sunrise Beach (Luke Campbell). 90cms - Divided between Adam Short’s Aughentaine Cavalier (Adam Short), Michelle Magill’s Golden Korona (Jordyn Magill), Philippa Auret’s Kontiki (IHB) (Noel McKee), Dee Barrett-Davies’s Lady Thunder Van Het Rozenhof (Dee Barrett-Davies), Lana K Cheney’s Morning de la Bouverie (Lyndsay Barnett), Maeve Lunny’s Okee Dokee (Maeve Lunny). 1m - Divided between Kara McKee’s Royal Equity (Jayne Walmsley), Jill McElrath’s Annaroo Flight (Jill McElrath), Joanna Curran’s Intis (Joanna Curran), Andrew Murdock’s Edentrillick Phoenix (William Greene), Miguel Bravo’s MHS Lisbon (Emma McEntee), Michelle Magill’s Golden Korona (Jordyn Magill), Rachel Redmond’s FOX C (Rachel Redmond), Christine Cosgrove’s Leestone Uno Momento (Hannah Agnew), Celtic Park Horses’ KG Clover Cruise (Alison Irwin). 1.10m - 1, Robert McKee’s Diamond Beach Babe (Melissa McKee); 2, Amber McSorley’s Milchem Kanko (Andrew McSorley); 3, Sarah Moore’s Shameless (Sarah Moore); 4, Kieran King’s Captains Orders (Kaitlyn King); 5, Hugh Treanor’s Charing Cross (Shane Treanor); 6, Gerry Marron’s Aga Khan Hero Z (Valentin Blanchard). 1.20m - 1, Emma Jackson’s Amy B (Emma Jackson); 2, Vina Buller’s Sillan Coevers (Emma Mcentee); 3, Philip G L White’s Texan Style (Tegan J White-McMorrow); 4, James Patrick Flood’s Wivollet Vanbeek (Emma Jackson); 5, Sharon Eadie’s My Plan (Emma Jackson); 6, Deirdre McMordie’s Drumaclan Jack (Sara McMordie). 1.30m - 1, Paul Boyle’s Delton (Abby Morton); 2, Philip G L White’s Texan Style (Tegan J White-McMorrow); 3, Julie Henderson’s Touch Of Time (julie henderson); 4, Leigh Anne Rea’s Cross Guidam (Valentin Blanchard); 5, Anthony Doherty’s Crystal Ben Magna (Jaymie Crawford); 6, Deirdre McMordie’s Drumaclan Jack (Jonathan Smyth). 1.40m Top Spec Autumn Grand Prix - 1, Brian Kieran’s HTS Blackrock (John Floody); 2, Derek Gaw’s Ardnacashel Coovella (Philip Gaw); 3, Sandra Duffy’s Caliva Charca MM Z (Darryl Walker); 4, Noletta Smyth & Roy Craig’s Mulvin Lui (Jonathan Smyth); 5, Trevor Clingan’s Ardtana Flash Forward (Charlene Clingan); 6, William Todd’s Roscrib de Ross (Peter Smyth).